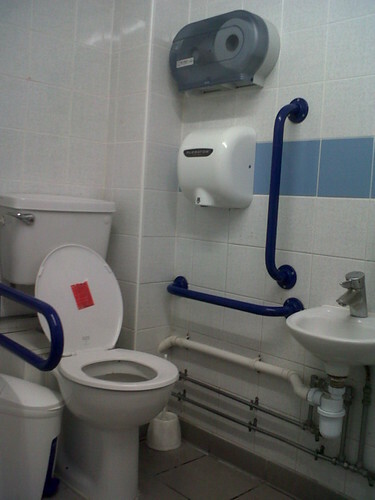 I'm supposed to reach the loo roll how? I'm supposed to reach the toilet paper how?, originally uploaded by Lisy Babe. The photo is of a toilet that looks fairly accessible at first glance: By which I mean there are several colour-contrasted handrails visible. Then you notice the toilet roll dispenser several feet higher. Where the toilet roll holder should be is a hand dryer. I did wonder if I was supposed to blow dry my ladybits. I had to stand up to reach the toilet paper (and that was a struggle, but then when standing I'm still only 4'10") and, of course, a lot of wheelchair users can't stand up. lisy_babe - I'm supposed to reach the loo roll how?